As young as they are, 3rd graders are old enough to begin doing research on their own! Good research skills will prove beneficial to children throughout their education, and now is the perfect time to teach students how to go about doing research. While conducting research, students will be learning how to look for information in a library and on the internet, and to keep track of their sources. 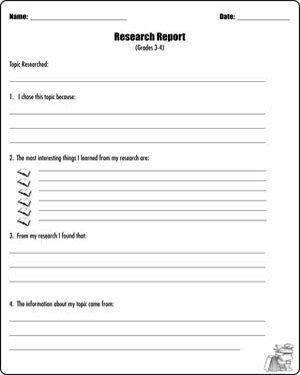 ‘Research Report 3 & 4’ is a report writing worksheet that can be used to help 3rd and 4th graders record their findings at the end of their research. Giving them this worksheet will help them understand what questions they will be expected to answer during their research.